Paddy cultivation is a very water intensive and laborious job. Paddy crop can be cultivated in different methods with different level of water and labour requirement. If you want to do rice cultivation then here is the complete guide on scientifically growing rice in India. Rice is the staple food of people from Southern and eastern parts of India. It is hence widely cultivated in India and other parts of Asia such as China, Japan, Indonesia, Bangladesh, Thailand, etc. Globally, China is the leading producer of rice with India being the next. As per statistics, West Bengal is the leading rice producer in India followed by Uttar Pradesh, Telangana, Andhra, Punjab, Orissa, Bihar, Chhattisgarh, Tamil Nadu, Assam and Haryana. Cultivating rice is indeed laborious and it needs a lot of water. Therefore, rice cultivation is practiced in those places wherein the labor cost is less and rainfall is high. Rice is the seed of a grass variety called Oryza sativa and Oryza glaberrima. Paddy plant has a fibrous root with the plant growing upto 6 feet tall. It has a round jointed stem with leaves being long and pointed. The edible seeds which are sold commercially as ‘rice’ grow on the top in the form of separate stalks. Technically this is called paddy as the seeds are covered with a brown colored husk. 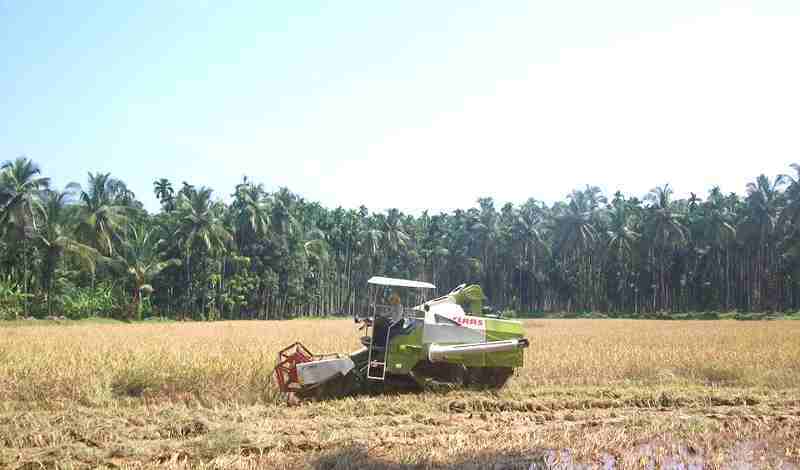 The paddy is then harvested and dehusked resulting in the commercially important rice. Often people confuse rice and paddy. Rice fields are also called as paddy fields. Rice is a tropical climate crop that can grow from sea level to an altitude of 3000 meters. Paddy cultivation can also be done in temperate and sub-tropical climate under humid conditions. A high temperature, humidity and sufficient rainfall with irrigation facilities are the primary requirements of paddy cultivation. It also needs bright sunshine with temperature ranging between 20 and 40⁰C. It can tolerate temperature upto 42⁰C. Since rice can grow in a variety of climate and altitude it is cultivated in different seasons in different parts of the country. In areas of high rainfall and low winter temperature (northern and western parts) rice crop is grown once a year- during May to November. Two or three crops are grown in the southern and eastern states. India has three rice farming seasons- summer, autumn and winter. However, the chief rice growing season is ‘kharif’ season also called ‘winter rice’. The sowing time is June-July and is harvested during November- December months. 84% of the country’s rice supply is grown in the kharif crop. Rice cultivated during rabi season is also called as ‘summer rice’. It is sown in the months of November to February and harvested during March to June. 9% of total rice crop is grown in this season. Early maturing varieties are normally grown during this time. The pre-kharif or ‘autumn rice’ is sown during May to August. The sowing time also depends on the rainfall and weather condition. Hence the timing may differ slightly from place to place. Generally, it is harvested during September- October months. 7% of the total rice crop in India grows in this season and short duration varieties which mature within 90-110 days are cultivated. Almost every type of soil can be used for rice cultivation provided the region has a high level of humidity, sufficient rainfall with irrigational facilities, and a high temperature. The major types of soils for rice cultivation are black soil, red soil (loamy and yellow), laterite soil, red sandy, terai, hill and medium to shallow black soil. It can be even cultivated on silts and gravels. If the cultivating soil has rich organic matter and if it powders easily on drying or forms a puddle when wet then it is considered to be ideal. Rice can be cultivated in both acidic as well as alkaline soil. Separate field channels are constructed to allow water to be delivered to individual seed beds. Thus the main field is not watered till it is time to actually plant in the main field. It is important to control the water flowing to the field or draining away from the field. This is necessary so that the nutrients applied are not lost. When there are deep cracks present in the soil a huge amount of water can be lost due to drainage of water through these cracks that run below the root zone. In such cases, the cracks must be filled before soaking. One of the ways is to do a shallow tillage before soaking the land. In case of clayey soils the land is puddled since it results in a hard pan. However, for heavily clayey soils puddling is not necessary. A field that is uneven in level consumes nearly 10% extra water than what is necessary for growth. The field is generally plowed twice before leveling. The second plowing is done with water in the field so as to define the high and low areas. Bunds form a boundary and hence limit water loss. They must be compact and high enough to avoid overflowing of water in case of rains. Rat holes and cracks must be plastered. Legumes are the most commonly used crops used for crop rotation with rice. This is especially in case of places with lower water supply. Rice in such places is cultivated only once a year and the rest of the year the land is fallow. Hence planting legumes in such period would optimize land use and also help increase fertility of soil. The seeds must be soaked in salt solution for 10 minutes. The ones that float must be discarded while the ones that sink are mature seeds that must be used for planting. Immediately wash the seeds after removing from the solution. Farmers are advised to soak the seeds in a good fungicide solution like carbendazim for 24 hours. This ensures the seed protection from fungal diseases. If the area of cultivation is prevalent in bacterial diseases like leaf blight, then the seeds must be soaked in Streptocycline solution for 12 hours. After this, they must dried thoroughly under shade and then used for sowing. Normally seeds are sprouted before sowing or then grown in nurseries before transplanting. Rice is cultivated in different methods depending on the water availability and weather. In areas where the rainfall is abundant clubbed with abundant water supply, wet system of cultivation is followed. On the other hand, in areas where irrigation facilities are unavailable and water is scarce, dry cultivation system is followed. 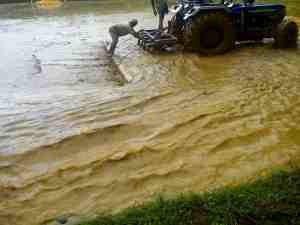 The land is thoroughly ploughed and flooded with water upto 5cm in depth. In case of clayey or loamy soil the depth must be 10 cm. Post puddling the land is levelled so as to ensure uniform water distribution. Seedlings are sown or transplanted after leveling. In this rice cultivation process the soil must have a good tilth hence it must be ploughed thoroughly. In addition, farm yard manure must be distributed on the field uniformly at least 4 weeks before sowing. The seeds are then sown with 30 cm spacing between the plants. Most farmers practice nursery bed method. Nursery beds are made occupying about 1/20th of the total field area. The paddy seeds are sown in the bed. They are ready within 25 days of sowing in low land areas while in higher altitudes they take about 55 days to become ready for transplantation. 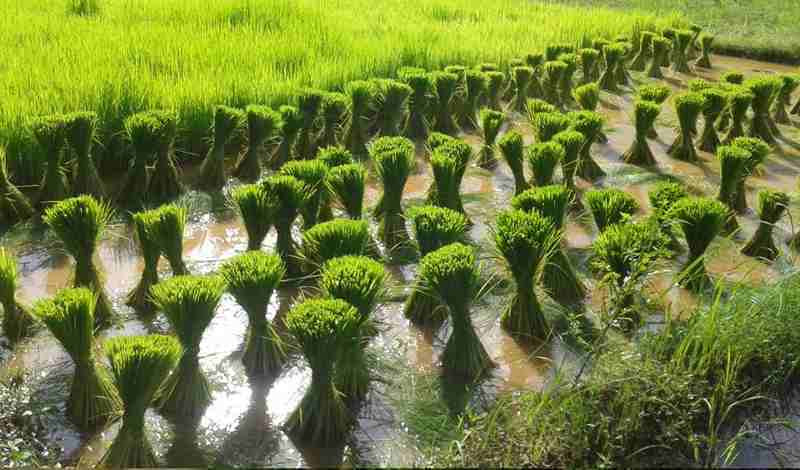 There are four different practices of cultivation of rice, viz. transplantation method, drilling method, broadcast method and Japanese method. Transplantation is the most commonly used method wherein seeds are first sown in nursery and the seedlings are transplanted to the main field once they show 3-4 leaves. Although this is the best yielding method, it requires heavy labor. Drilling method is exclusive to India. In this method, one person ploughs a hole in the land and the other person sows the seed. Ox is the most commonly used ‘person’ to plough the land. Broadcast method generally involves scattering of the seeds manually over a large area or in the entire field. Labor involved is very less and so is the precision. This method produces very less yield as compared to others. Japanese method has been adopted for the high yielding variety of rice and those that need a high amount of fertilizers. Seeds are sown in nursery beds and then transplanted to the main field. It has shown tremendous success for the high yielding varieties. 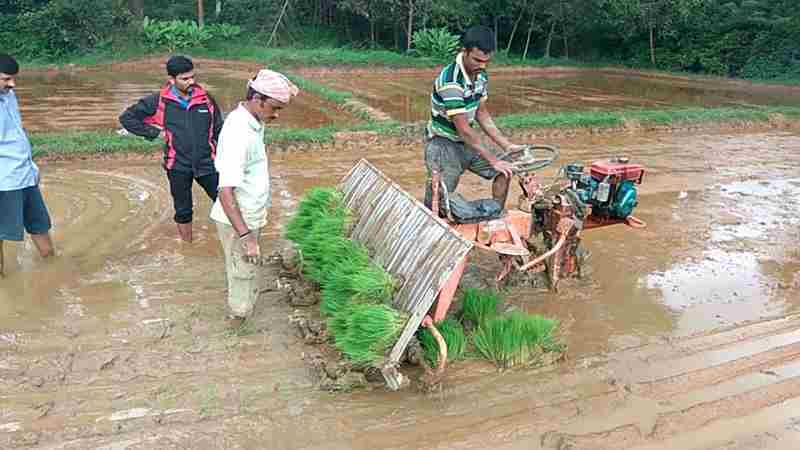 Another newly found technique is SRI method of rice cultivation. This is a high yielding method with less water but this method is more laborious. Spindle-shaped spots on leaves with grey centers. Nodes rot turning black and thus breaks. This disease can affect the crop at all the growing stages- nursery, tillering and flowering. Soak the seeds in carbendazim for 12 hours before sowing. Avoid a heavy dose of nitrogen fertilizer. During transplantation, the roots must be dipped in carbendazim solution immediately upon uprooting. Dark brown, oval spots on stems, leaves and plumes. Occurs in poor and deficient soils. Can occur in nursery or in field. Since it occurs in deficient soils, the deficiency must be corrected by adding nutrients and fertilizers. Resistant varieties must be cultivated in deficient soils. Treating the seeds with Agrosan is also effective in controlling the disease. Yellow to white lesions along the margin gradually spreading around the whole leaf. Spreads fast in case of winds, incessant rain and warm temperature. Avoid nitrogen fertilizers in excess. Soak the seeds in Streptocycline for 12 hours before planting. Affected crops are sprayed with Agrimycin 100. Fungus attacks panicles and spikelets stick together. Hence no grains are formed. Infected plants are shorter and hence go unnoticed. Treat the seeds with carbendazim before planting. The affected seeds can also be sprayed with it during the initiation of panicle. Affects the sheath of the leaves. The affected parts are blighted. Being soil-borne disease, planting closely must be avoided. Avoid applying heavy nitrogen fertilizers. Spray the affected crop with carbendazim. One of the essential factors in rice cultivation is in-time rice harvesting otherwise the grains would shed. Irrigation of the field is completely stopped about a week before harvesting. This dehydration process helps in grain ripening. It also hastens maturity. In case of early and medium maturing varieties, harvesting should be carried out 25- 30 days after flowering. The late maturing varieties are harvested 40 days after flowering. They are generally harvested when the moisture content is about 25%. Post harvesting, drying is carried out gradually under shade. If done scientifically and then Paddy cultivation is a profitable agriculture business. To minimize farm labour mechanized methods should be adopted from planting to harvesting rice crop. I want to give paddy cultivation essay. Want some more like management, chemicals name of pesticide and want to know about clearly the methods of showing or plating and want state wide cultivation details also and want to know resistant variety names also, thanks.